BIG DATA SERIES – WHAT IF YOUR CAR COULD ONLY TURN LEFT? For UPS, that wouldn’t be much of a problem. The parcel delivery company has had sensors on its vehicles for many years. Its data scientists noticed that drivers were losing time (and burning fuel) whenever they waited to turn right across traffic, so they began testing a left-hand only approach. The results were staggering. Even though average delivery distance went up, time and fuel consumption dropped dramatically. UPS now routes its vehicles to turn left 90% of the time, saving 35 million litres of petrol, reducing green-house emissions by 20,000 tonnes and removing over 1,000 vans from the road. Sensor data, like that used by UPS, is now one of the primary raw materials of the data economy. The first sensors to measure motion in three dimensions, known as accelerometers, weighed about a kilo and were the size of a large loaf of bread. Now, they are just 4 millimeters across and are ubiquitous. A modern car has a couple of thousand sensors measuring oncoming head lights, tyre pressure and traction, sudden stops and engine parameters. That is peanuts compared to a jet engine – its thousands of sensors detect temperature, pressure, speed, flow and vibration levels to ensure everything remains within tolerance. According to Virgin’s IT director, David Bulman, each flight can produce more than half a terabyte of data helping to predict maintenance requirements or to improve fuel efficiency. Sensors are an important generator of big data but are not the only one. 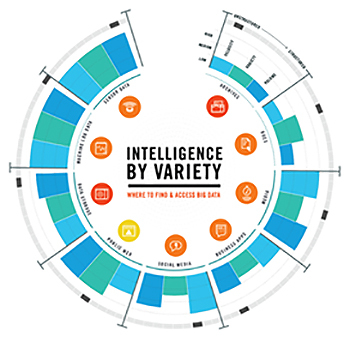 Kapow, a software company, has produced a handy infographic that presents 9 main data sources. Many of these are well known – archives, documents, media and the public web have been around for years. But much of the explosion of big data has happened on the back of sensors, machines and, increasingly, social media. Let’s take a look at some of the sources of data and how the information is being used. You may have seen the car google-uses for mapping. Its data-source? Lidar or light radar. A typical car has sixty-four lidar lasers and collects nearly a gigabyte of data per second. A little higher up, the Indian PSLV rocket set a record by deploying 103 satellites in a single launch; 88 of those are owned by US company, Planet. The objective – to image the entire Earth, daily. Out on the farm, John Deere agricultural equipment contains sensors that monitor moisture, wind speed, humidity, solar radiation, rain-fall and leaf wetness. The data is transmitted wirelessly, enabling farmers to determine when crops should be irrigated and harvested. Out to the pub, Carlsberg is now using sensors to measure beer flow from its kegs. It has discovered that 70% of its beer consumed in urban bars is bought between 8 and 10pm, while only 40% of beer in suburban markets is sold in that time period. Armed with this data, the brewer is able to devise specific pricing and promotional packages to match demand profiles. Some of the most interesting data sets and not coming either from machines or from the environment, they’re coming from us. MIT has developed a system which uses wireless signals to measure an individual’s breathing and heart rate. Across the room. Even in early stage development, it can measure four emotional parameters – excitement, happiness, anger and sadness – with 87% accuracy. Nexar, an Israeli start-up, is using drivers as data sources. Its app turns their smartphones into dash-cams tagging footage of their travels via actions they normally perform. If many unexpectedly hit the brake at the same spot on the road, this signals a pothole or another obstacle. Their goal is to offer all sorts of services to help drivers avoid accidents – something insurers will most certainly find attractive. Why is it that Starbucks opens branches on the same street within close proximity? Big data. They are analysing consumer behaviour – numbers, demographics, drinking habits – and can develop a fairly accurate estimate of the success rate of each new location, even when it is only 100 meters away from an existing shop. Consumer behaviour offers an incredibly rich source of data. Not restricted to merely what we buy, it includes our interests and our attitudes. Where is one of the most popular places to harvest consumer behaviour data? From those little breadcrumbs you drop every time your browse the internet. Otherwise known as the cookie. ⟵CANALYTICS COLUMN: ARE COUNCIL WEBSITES BOUNCY?